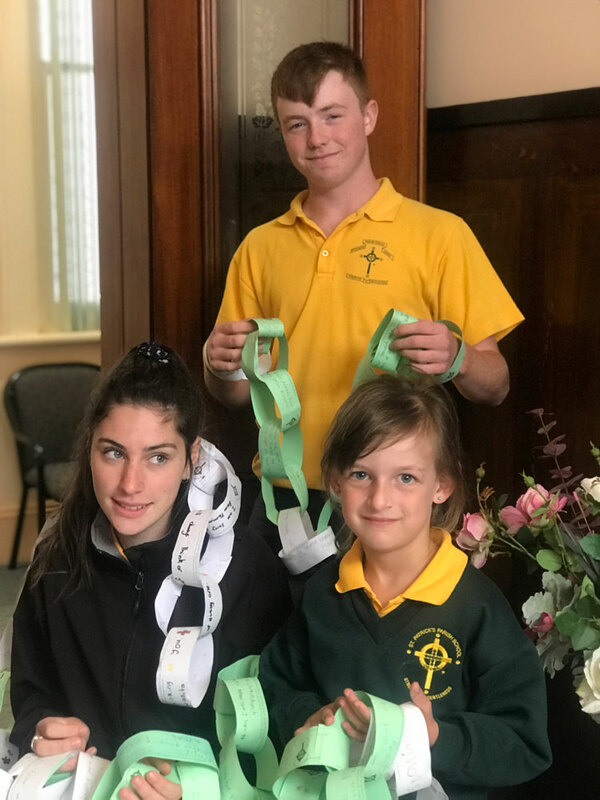 St Pat’s Kindergarten student Abbie Anderson, flanked by Year 10 students and school captains Nowell Utrush and James Bannon show some of the Cooma prayer chain with principal Frances Robertson. When a man with a gun stole the lives of 50 people in Christchurch last month, the impact was profound and widespread. Beyond those killed or injured and their loved ones, beyond a city and a nation in mourning, people around the world struggled to comprehend the barbarity of the slaughter and grappled with a sense of impotence and powerlessness at not being able to help in some way. Because what can you do? 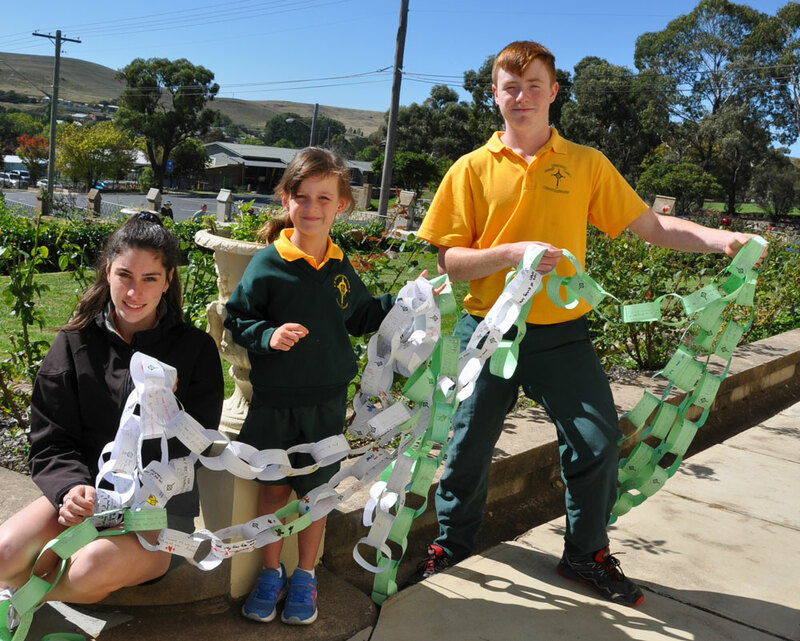 “You can love,” said Frances Robertson, Principal of St Patrick’s Parish School in Cooma. 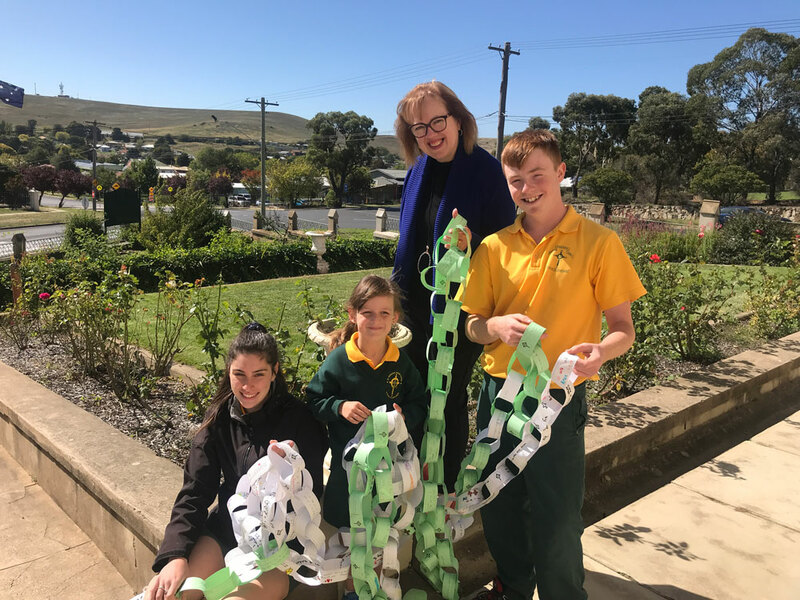 As one small gesture of love, compassion and solidarity, the Catholic community of Cooma has built a prayer chain made up of individual message links from the students and parishioners. 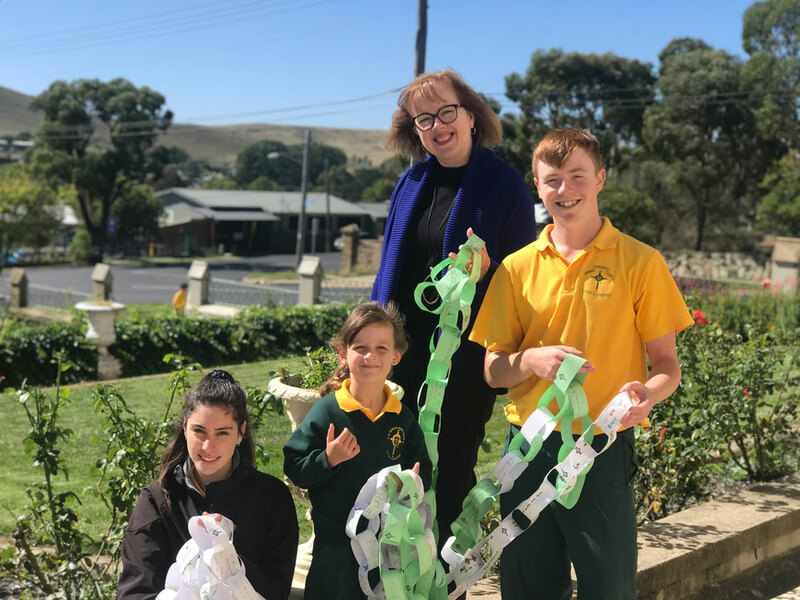 “The idea originally came from Fr Mick [McAndrew] as a combined Parish / School initiative in response to the massacre at the Al Noor Mosque and Linwood Islamic Centre in Christchurch,” Ms Robertson said. The prayer chain has offered an opportunity for the community to do something practical to express their sadness and support. One of the difficulties inherent in broaching a tragedy like the Christchurch massacre with children is the importance of not upsetting them unduly or over-sharing information they don’t really need or are unable to absorb or comprehend. Conscious of that, the school took a very different approach for children at various age points. “For the children in Kindergarten, we simply talked about how some people are hurting in another country, so let’s send some loving kindness to them,” said Ms Robertson. 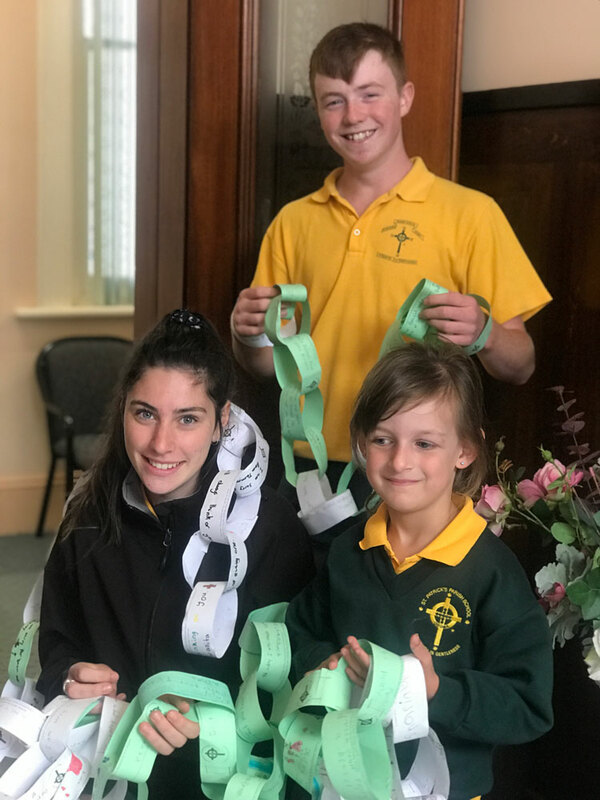 “And if you look at the Kindergarten prayer chains, they have their names and a pretty picture; it might have a hug and a kiss on it, or a smiley face. “The Year 10s had already been scheduled to attend the cathedral, a mosque and a synagogue in Canberra as part of their Interfaith studies and this offered them an opportunity to express their condolences in a very direct way to the Imam at the mosque in Yarralumla. The next step of the process will be boxing up the prayer chain and sending it to the Al Noor mosque in New Zealand. Ms Robertson said it wasn’t important if the box was even opened at the other end or, or if it was boxed away in storage. “This was an opportunity in expressing our love, our compassion, to others in pain,” she said. “If they see, from a little country town in Australia that we remembered them and are thinking of them, that may touch someone or ease someone’s burden, even a little and that would be great. Has anyone done anything for the thousands and thousands of Christians murdered throughout the world – especially in poor countries? A wonderful act of unconditional love to our brothers and sisters who have suffered so much. We all need love and kindness and understanding for the beliefs we hold. God does not have borders.